We have been involved in many projects moving products between processing stations in factories, and delivering finished goods for dispatch into warehouses. We would normally supply the complete system including all electrics and control. 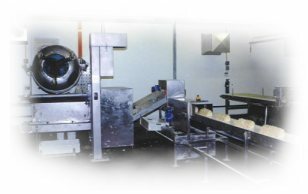 For ‘wet’ product we would design and build special purpose conveyors to ensure all hygiene and cleaning requirements are met. For carton conveying in non-food environments we try and source propriety conveyor components from companies such as Interroll or Conveyor Units to give the customer the best value for money. We would then design and build in-house any special purpose units for the system i.e for product diversion, merging, inspection, or orientation. We have covered a wide range of applications, from lorry tyres with 1000 mm wide heavy duty rollers, to cartons and crates 1-25 kg, to CD’s and videos, to washable food product conveyors (pastry block transport and distribution system shown here), to pharmaceutical standard conveyors with special belt release mechanisms for cleaning. We believe that we are competitive in the market and more importantly can bring our own unique experiences to offer good advice at the specification stage. We had one such experience with a computer components and games distribution company : After the initial enquiry and site visit we were able to re-specify the whole material movements system within the factory for order picking and packing. Approximately 70% of the seasonal labour costs were saved as a result of taking up our recommendation. This was achieved by applying some very basic industrial engineering principles that, up until then, had been overlooked.